Off the coast of Ireland on July 30th, 1915, the German submarine U-28 torpedoed the British ship Iberian. It went down rapidly, stern first. As the crew of the U-28 watched there was a large explosion that sent water and wreckage a hundred feet into the air. A "gigantic sea animal" was thrown to the surface and remained visible for about fifteen seconds before it sank. It was shaped like a sixty foot long crocodile with webbed feet. "A very large snake passed the ship. It was 3 or 4 feet in circumference. The back was of light color and the belly yellow." - S.H. Saxby, Master Mariner, Bouchurch, Isle of Wright. In 1808 an Australian three-masted bark was attacked by a sea monster that, "had climbed across bow and bitten or chewed, one of the hands." It's eyes were the size of a "warrior's shield." The attack continued until the captain went below and returned with guns. He fired them into the animal's eyes and the monster returned to the ocean. On December 7th, 1905 at about 10:15 am the oceanographic research yacht, Valhalla, was cruising off the coast of Florida and a "large fin, or frill, sticking out of the water," was spotted. 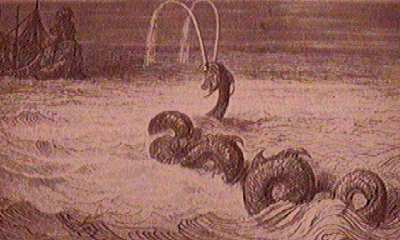 The frill was six feet in length and projected almost two feet out of the water. "A great neck rose out of the water in front of the frill," noted Mr. Meade-Waldo, a scientist on board. The neck appeared to be about the thickness of a man's body. The creature moved its head and neck from side to side in a peculiar manner. Three days after the Valhalla incident the Happy Warrior, a merchant sailing ship, reported a "sea snake of great magnitude appeared off our port bow. Was several lengths of our ship. Had long neck. Sounded after few minutes. Estimated speed six knots." The Happy Warrior was cruising only 80 miles from where the Valhalla sighted it's creature. "I was lying in Round Pond, in Broad Bay, in a public armed ship. At sunrise, I discovered a large serpent, or sea monster, coming down the bay. It was on the surface of the water. The cutter was manned and armed. I went myself in the boat. We proceeded after the serpent. When within a hundred feet, the mariners were ordered to fire on him. Before they could make ready, the serpent dove." A U.S. Navy nuclear submarine left it's home port to start it's patrol. Mysteriously the boat's delicate sonar mechanism failed without warning only a few days into the voyage. The sonar was so critical to the sub's operations that the boat was forced to return to port for repairs. Examination of the sonar revealed that the rubber-like outer cover of the device had been torn off. Embedded in the tattered remains were enormous hooks. Scientists determined that these hooks, several times larger than had ever been seen before, were from a giant squid that had apparently attacked the sub, thinking it was a whale. The sub had been recharging batteries at night on the surface when without any kind of warning a "strange beast" began to climb aboard from the sea. "This beast had large eyes, set in a horny sort of skull. It had a small head, but with teeth that could be seen glistening in the moonlight." The animal was so large that it forced the U-boat to list greatly to starboard. The captain feared an open hatch would drop below the waterline, flooding the sub and sinking it. "Every man on watch began firing a sidearm at the beast," Krech continued. The animal had hold of the forward gun mount and would not let go. The battle continued until the animal dropped back into the sea. In the struggle, though, the forward deck plating had been damaged and the sub could no longer submerge. "That is why you were able to catch us on the surface," the Captain concluded.